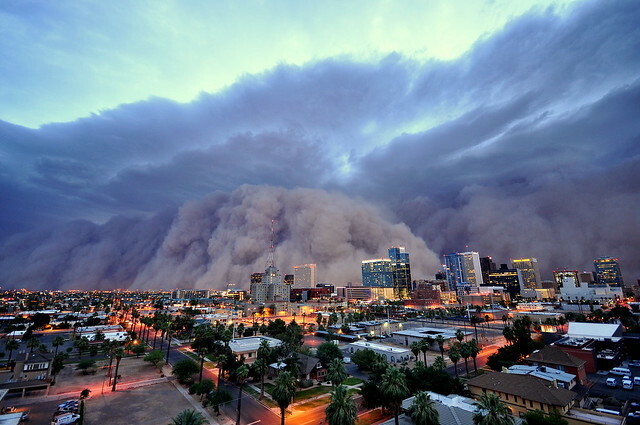 No special effects here this is an actual photograph of downtown Phoenix during a haboob– an Arabic word that roughly translates to “gigantic dust storm.” An haboob forms in a weather front in arid regions- thus in the picture your eyes are drawn to the beige dust cloud, note also the huge grey clouds in the background. 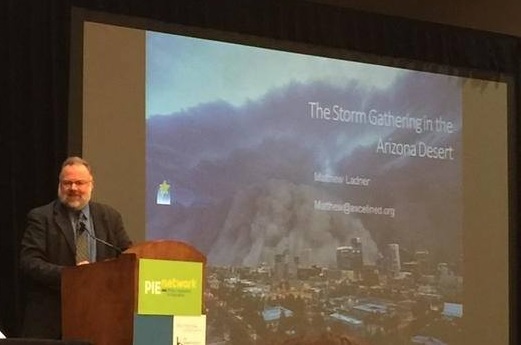 Fortunately you probably live in a place that won’t experience an Arizona-style haboob- at least not weather-wise. In terms of your state’s politics-get ready. It’s coming to get you. Ronald Brownstein has written a series of articles in the National Journal about demographic change and inter-generational conflict under the theme of the Brown and the Gray. He describes the two massive generations: old and white Baby Boomers and above vs. young and brown population as two tectonic plates. The earthquakes have already started here in Arizona. Rather than dismiss Arizona as a remote backwater, you should pay close attention to what has transpired here and learn from our mistakes. Arizona’s demographics and attendant controversies lie in your state’s immediate future. Regardless of which state you live in, over the next 15 years it will be getting much older and will have a significant increase in the Hispanic population, much of which will occur in the youth population. Paul Taylor’s book The Next America uses extensive polling data to paint a portrait of Baby Boomers as relatively wealthy but deeply miserable. Two sources of Baby Boomer anger: their Millennial kids still living in their house and a widespread view that the country has changed and no one asked for their permission. One cannot help but wonder how the inevitable grown up conversation about Uncle Sam’s $55 trillion in unfunded entitlement liabilities will worsen moods further. I am not inclined to weep if my state happened to expand public school staffing at a rate slower than the national average, given that the national average expanded staffing at a rate ten times greater than enrollment growth and received precious little for it in return in terms of student learning gains. While I have more than my share of gray hair, I don’t think this qualifies me as an old grouchy white guy. I’m painfully aware that the future of Arizona rests on providing high quality education to all students-including Hispanics. Simply throwing money at a dysfunctional system may satisfy some sort of superficial need to show that you care, but it simply won’t do in terms of a solution. We need far more than symbolism. I’m not sure how this story ends. The elderly depend heavily on government spending for health care and the young for education. Uncle Sam has a deeply troubling balance sheet and states have become very dependent on his largess. Deep-seated policy related pathologies define both health and education. A generational conflict over scarce resources looms, and it will have a barely if at all disguised ethnic subtext. The only (relatively) happy path out of this fix lies in innovation-we need more effective and most cost-effective education and health care delivery systems stat. This entry was posted on Wednesday, October 7th, 2015 at 6:20 am and is filed under Age Demographic Change. You can follow any responses to this entry through the RSS 2.0 feed. You can leave a response, or trackback from your own site.